My cushaw squash weren't storing in the basement as well as I'd hoped. I had regularly been checking all my squashes, and one of them had a small soft spot. I cut into it right away only to discover that while the flesh looked fine, the pulp with the seeds was all black and musty. I had just finished reading a book on survival by Cody Lundin in which he wrote that the sickest he ever was from something he ate was from eating an old garden squash (and he has eaten some really nasty stuff out in the wild). Apparently squash can get full of mycotoxins. I decided to toss the whole thing. After some thought, I went ahead and processed all my cushaw squash that was still good. I didn't want to risk losing more. They have the shortest storage life of all the winter squash I grew anyhow. I made Cort carry them all upstairs for me. Just kidding. I had Cort hold it for about two seconds so I could take a picture, and he almost fell over. I got twelve cups of puree from this cushaw, and made pumpkin bread for the neighbors. Meanwhile, I'm hopeful that my butternuts and blue hubbards hang in for a few more months. How did the settlers store their squash? Or did they just have to eat them right away? Love the pic of Cort! So sorry you had trouble storing these but at least you saved the rest. I know the neighbors appreciated the baked bread. I haven't had much success with keeping pumpkins very long, it is almost like something gets into them when they are growing that causes them to rot quickly. Butternut keep much longer. If Cody can't handle one I sure don't want to try as his system is probably close to what cave men were like. That's a big ol squash there!!!! I'm clueless when it comes to veggies and fruits.. I eat them, I don't know how to grow them. Maybe one day. You are definitely the queen of squash! Cort is so cute! He doesn't seem to mind toting it. 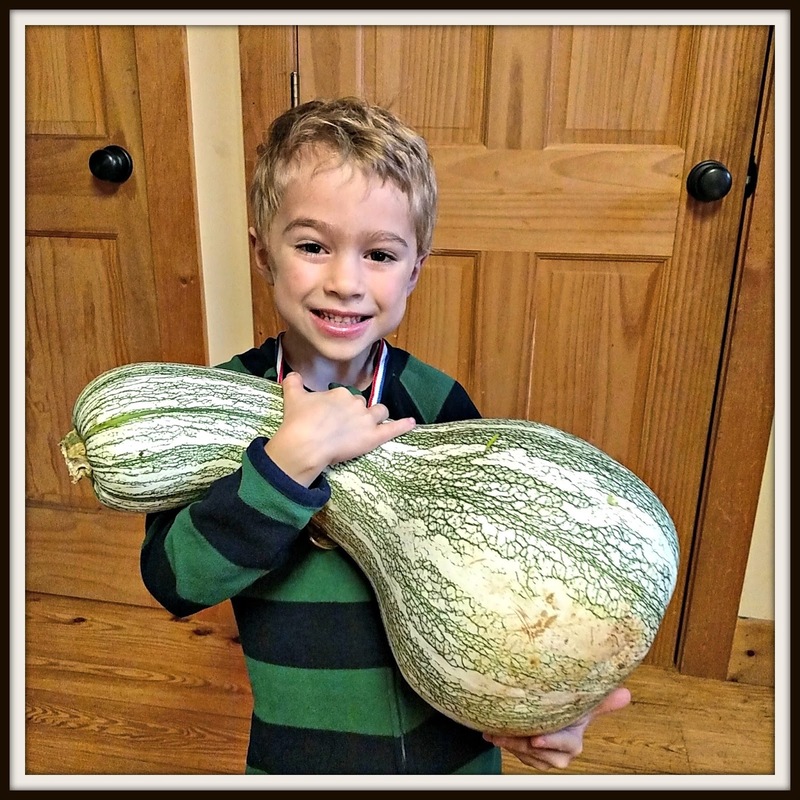 :-) I think it's great that your boys like squash. I didn't like it when I was little. But many cooks in the south like my mom tended to overcook it so it's a mush--not for me. Doubtless a good decision to go ahead and process what you had on hand. I've never had much luck trying to store vegetables in their natural state. Fun photo! :) Of course, it's good that you noticed the mold and rid of the squash. I didn't know you can't keep them long. That thing is HUGE! --And what an adorable little helper. =) I applaud anyone who grows food. I've tried a couple times, but just keeping the house up is more than enough. Finding the time to weed and fertilize, that just might put me in the looney bin. That is a really big squash! He looks cute holding it! That is a monster squash for sure,, but we know it must certainly have been good. Oh Cort is a strong boy to hold it for a few seconds.! Too funny. I was about to say that Cort is one strong boy! Glad you were able to make use of your squash before they all turned soft. YOUR SQUASH LOOKS SO HUGE... I LOVE VEGGIES!! YOUR SON IS VERY STRONG and SO HANDSOME. HAPPY THANKSGIVING TO YOU, YOUR DEAR FAMILY & LOVED ONES! !